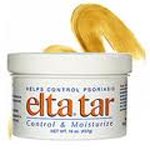 Elta Tar comes in a very small and thin tub. It is a powdery cream that is supposed to melt upon contact with skin. This allows it to provide greater moisturizing ability and gets rid of any fear of having greasy skin afterwards. Though this is not a usual method of treatment, it is apparently highly effective, at least according to reports. When I used it, I found coverage to be patchy and it provided only half of the afflicted areas of my skin with the coverage I required. Ingredients for Elta Tar are listed as follows: 10 % Topical Coal Tar Solution (2 % Coal Tar, SD 40 Alcohol, Polysorbate 90) in moisturizing Elta base: Petrolatum, Paraffin, Mineral Oil, PVP Eicosene Copolymer (Inert), Moisturizing Elta base of Petrolatum, Paraffin, Mineral Oil, and PVP Eicosene Copolymer. It was only after buying it and applying it to my skin that I read the side effects of Elta Tar, many of which have happened to me since I started using it. The list of side effects actually includes the same things that it is supposed to cure, believe it or not. So even if it does succeed in curing you, if you have sensitive skin, the solution can become the problem for you. This is very dangerous and can cause more problems than it can prevent. I would never put it on my face again, or anywhere else on my body for that matter.